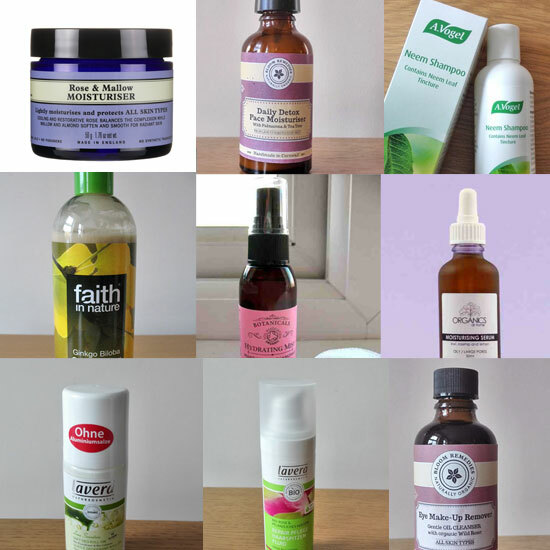 There are so many natural health and beauty brands on the market today with new ones are appearing all the time that the choice you have these days is enormous, sometimes making it difficult to buy the product you need. But let’s not forget the brands who’ve been established for many years and have a vast array of experience and research behind them – A. Vogel international health brand is one of them. 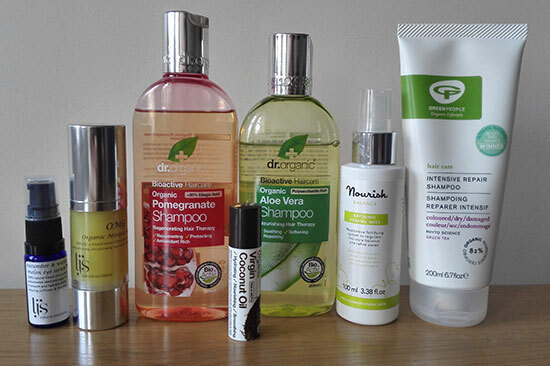 I’ve been sent some of their natural skincare and beauty products to try and here you will find out what I really thought about them. In this post I also share some information about the brand’s founder, brand ethos and some of the principles they follow. Read on to find out whether A. Vogel is the brand you should try. A. Vogel was founded by Alfred Vogel, a Swiss naturopath and herbalist who was convinced that “Nature gives us everything we need to protect and maintain our health”. He travelled the world to research and study herbal remedies and medicinal plants in different countries (just one of the reasons for his travels) – on one of his trips in the US the Red Indian chief Ben Black Elk introduced Alfred Vogel to the purple coneflower (Echinacea purpurea) and Alfred took Echinacea seeds home where he started cultivating and researching the plant. Eventually he created Echinaforce, his flagship product that the brand became famous for. What’s more, A. Vogel continually test their products and their effects in clinical trials and always aim to optimise and improve them. Now, what is not to love about this brand? 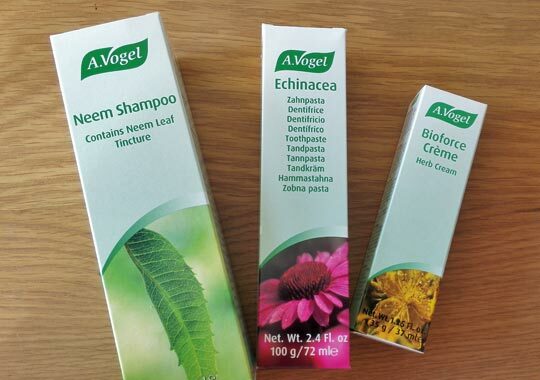 Well, let’s see how I got on with the Vogel products I tested. This is the first time I tried neem shampoo and I was really interested to see what difference will it make to my dry and itchy scalp. I’ve tried several different natural shampoos to help me treat this pesky problem and while I did see some improvement, the problem was still there. 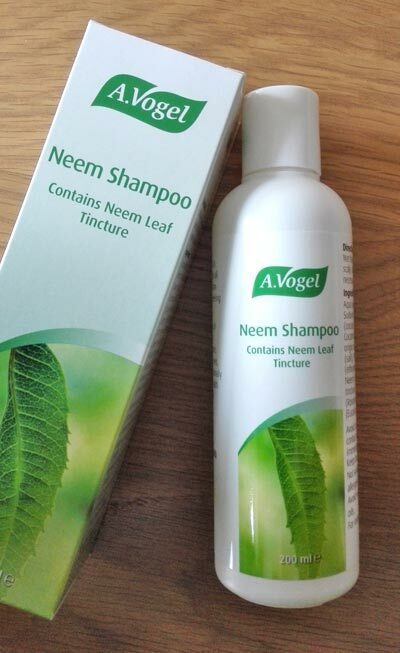 Neem Shampoo from A. Vogel* (£5.99 for 200ml) contains neem leaf extract which is known for its anti-inflammatory and anti-bacterial properties – it helps to soothe the irritated scalp, reduce the itchiness and improve scalp health. Neem also helps to stimulate hair growth. The shampoo has quite strong scent from Eucalyptus oil it contains and this is the scent that overpowers any other. The shampoo foams really well and it leaves my hair feeling fresh and properly cleaned afterwards. What I love about this shampoo is that it contains only the ingredients that are really needed (the list of ingredients is not too long) and you won’t find any parabens, SLSs, glycols and other nasty chemicals in it. While it helps to soothe dry, irritated and flaky scalps, if you have a persistent dandruff this may not be that effective. For me, it was effective to certain extent – it helped to soothe my irritated scalp, reduce itchiness and my hair felt fresher for longer after using it (my hair normally gets greasy really quickly). I did see the improvement in my scalp health, so big thumbs up for that! It seemed to have worked better than any other natural shampoos I tried in the past and with the price tag of less than £10 it’s really affordable so I will be definitely buying it in the future. Aqua purificata (purified water), Sodium C14-16 olefin sulfonate (coconut origin surfactant), Cocamidopropyl betaine (coconut origin surfactant), Xanthan gum, Neem (Azadirachta indica) leaf tincture, PEG-60 almond glycerides (ethoxylated sweet almond oil), Rosmarinus officinalis (Rosemary) oil, Eucalyptus globulus (Eucalyptus)oil, Citrus grandis (Grapefruit) extract. 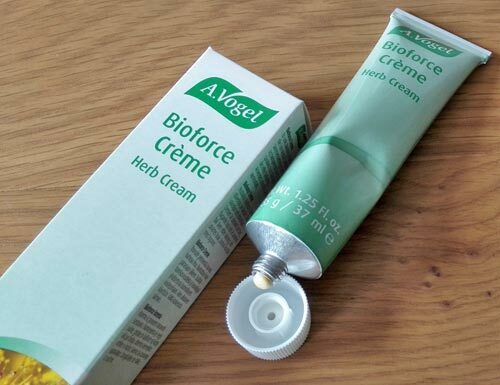 Bioforce cream* (£5.99 for 35g) is a cream made from completely natural ingredients and it’s intended to be used on rough, dry and cracked skin but it can also be used for other skin irritations such as shaving rash. The first ingredient on the list is lanolin which I suspect is what gives this cream a distinctive smell which I am not that big fan of. It’s quite unusual but difficult to describe. However, I am not that bothered about the scent, for me it’s more important its effectiveness. Amongst other ingredients you will find in this cream are: St. John’s Wort oil, Sunflower seed oil and Calendula Extract (known for its soothing and healing properties). I’ve been using this cream for various skin irritations such as shaving rash, irritated skin after long cycle ride and the dermatitis on a palm of my hand (I blame cycling for this but not sure how it developed!). It works well for shaving rash and it helped me prevent red spots on my underarms after shaving. It did wonders to my dermatitis, helping it to clear up when some balms didn’t really work for this. I haven’t had an opportunity to try this, but you could try it on insect bites as well and see how that works. Overall it’s a good cream for minor skin irritations (good to take with you on your holiday!) but if you want something really moisturising using balms will work better. 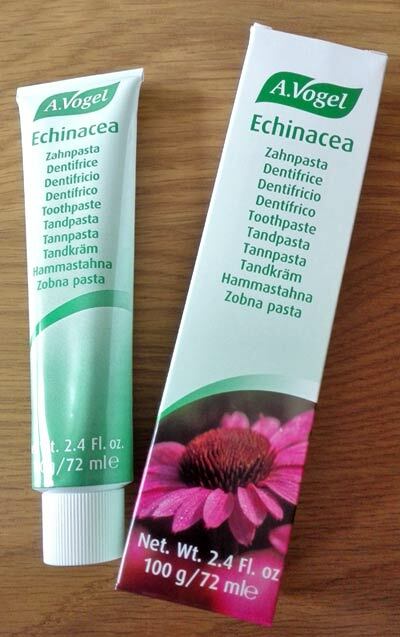 If you like to use 100% natural toothpaste, this Echinacea toothpaste from A. Vogel* (£4.95 for 100g) is something you should give a try. Its herbal extracts and essential oils will leave your mouth feeling fresh and clean. Unfortunately it doesn’t really foam which I found a bit strange as I am not used to it. Because of this it almost feels like my mouth are not getting cleaned properly but they do actually as I can feel the freshness at the end. Maybe this is something that just takes time to get used to, but it doesn’t mean your teeth are not getting cleaned properly. The toothpaste does have unusual brownish colour and the taste is not that typical minty taste you will normally find in toothpastes – it’s different but I didn’t find it an issue. The good thing about it is that it does not contain palm oil which some natural toothpastes do, and all the herbal ingredients will protect your mouth well. A. Vogel is a brand you should definitely not ignore – extracts from organic freshly harvested plants, affordability and environmental sustainability are just some of the things I love about this brand. On their website you will find all their herbal, beauty and health products and if you decide to order anything the postage is free if you spend over £20. What do you think about A. Vogel brand? Have you been using any of their products? * PR samples, my honest opinions always provided. I have not been paid to write this post, I’ve only been sent free products in compensation for my time.